mommy's reviews: Preparing Your Nursery For Your New Baby!!! Do you remember that I recently wrote a review for Seventh Generation Free & Clear Diapers? Well, Seventh Generation is an awesome company that not only takes care of your home needs, but also your baby needs as well! I did like the diapers and thought they did a great job...not to mention that they are free of so many nasty chemicals. This may seem like a no-brainer but really, it does bear some thought. Are you having a girl or a boy? Do you want to stay gender neutral in your decorations? What about a theme? When I was planning my nursery, I went with the Classic Winnie the Pooh theme as it would suit a girl or boy very nicely. I also loved the colors as they were soft and subtle. Decorating also helps you to get in the "mood" for baby and helps build the excitement. When you walk into a baby store I am POSITIVE that you are overwhelmed by how many cribs they have. I know I was. I thought I knew what I wanted until I saw what was there. Then, I had choices like color, size, height, conversion cribs, bassinets, etc. Oh boy!! That decision was made simple when we had a crib purchased for us as a gift and it was GORGEOUS! It is a light pine color and is the drop-side version. (This was before they found issues with that style). You want to make sure you get a good crib because if you are like me and want a few children, it will have to last through each child. New baby clothes are soooo cute, aren't they? Well, I highly recommend washing them in fragrance free laundry detergent before they are worn by baby. This is because you don't know who touched the clothes before they came to you and where they have been. Ewwww. Just the thought makes me shudder. It is also nice to use a baby detergent, if possible, because it will not irritate a sensitive skinned baby. You can then make sure all the clothes are put away neatly and ready for baby's arrival! My dresser/changing table. Isn't it gorgeous?!? I knew from the time I found out I was expecting my first that I wanted a glider for my baby. It would need to be wide, comfortable and smooth riding. When my glider came home I fell in love instantly. It is dark cherry in color and has dark maroon cushions. It is simply stunning. The other piece of furniture you will need is a changing table and /or dresser. I am also very blessed to have an antique dresser that my father in law refinished and it also is gorgeous. 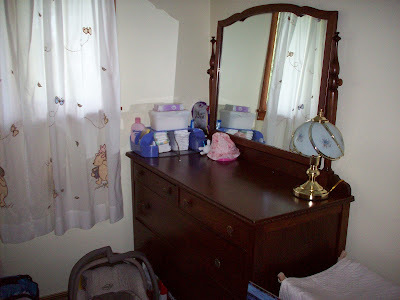 It is a full sized dresser with a huge mirror and flat top for changing baby. Furniture is important and you need to be sure it is something that you will be able to live with long-term. Ok. So, diapers are pretty much a necessity. We buy our diapers in bulk from our local wholesale club now that our children are in one size for longer than a week. If you are bringing a newborn home, chances are you will need a newborn sized diaper. So, buy those in advance so you are ready. Newborns need changed ALOT so having some extra on hand is wise. In my house, most of my light fixtures plug into the wall which means I don't have many ceiling-mounted lights. So when it came to getting a light for the nursery, I was kind of stuck. I had no shelves to put something on and I had very little space for a stand up light. So, I opted to get a small lamp to put on the end of the changing table. I have also heard of using chandelier-type lighting to put over baby's crib to act as an eye-catching piece for baby to stare at. Neat idea! When you have to change a diaper, take a temp or give medicine you don't want to have to be going to several different places to get your supplies. Make sure everything is right there where you can reach it easily. I have a caddy that sits next to the changing pad and it holds my wipes, powders, lotions, clippers, creams, aspirators, cloths, diapers, etc. It is WONDERFUL and has always made my life so simple when it came to caring for the baby. My babies LOVE the mobile above the crib. It is a Winnie the Pooh mobile that has a crank-style music box. Nothing fancy. The over the crib mobiles are nice but I would LOVE to own a mobile that attaches to the side of the crib that has lights, music, sounds, etc...something that I could operate by remote control. I know they are out there I just have yet to purchase one. This is a wonderful tool to use to help baby get to sleep at night. 9. Invest in some "white noise"
I have never tried this one but have heard wonderful things about it! Get a small fan and place it in baby's room. Run it on low and believe it or not, the noise is ambient enough to soothe a baby. There are also machines that you can buy that make a variety of sounds perfect for babies. To me, the fan idea seems most practical and I have also heard that it can help prevent SIDS (do your research, I only know this because I have read it. I am NOT a medical professional so if you are looking to prevent SIDS talk to your pediatrician and discuss the options that are available for prevention.). 10. Get a laundry hamper! This also may seem like a no-brainer for some (and believe it or not, I didn't think of it at first either) but this is a very important piece of sometimes-forgotten furniture for the nursery! I like to wash baby's clothes separate from mine so this is why I have a small hamper at the end of my changing table. It sure is easy to just take off dirty clothes and toss them into a hamper without having to take them to a different location in the house. It also makes transporting the clothes to the washer a breeze. So, there you have it! Those are my tips on getting your nursery ready for your brand new baby! What about you? Do you have some tips that I didn't share that have worked well for you? Please share them! And remember...Seventh Generation has all your baby needs covered including your diapers and wipes!!! Check out their other products today!! !